The issue has come to the forefront amid the Catholic Church's overall reckoning with the sexual abuse of minors and the #MeToo-inspired acknowledgement that adults can be victims of abuse when there is an imbalance of power in a relationship. 'Should we do something more? Yes. Is there the will? Yes. 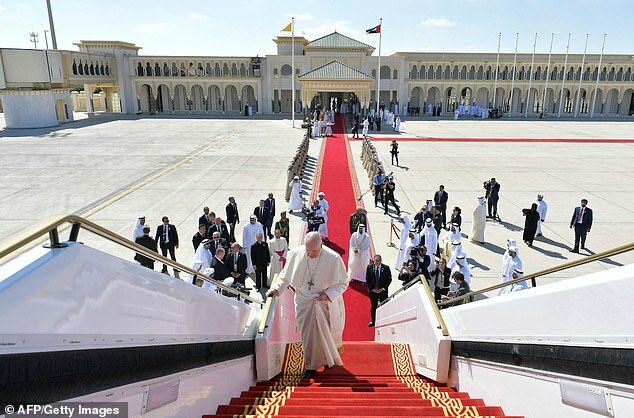 But it's a path that we have already begun,' Francis said while returning home from the United Arab Emirates. In November, the organisation representing all the world's female Catholic religious orders, the International Union of Superiors General, publicly denounced the 'culture of silence and secrecy' that prevented nuns from speaking out and urged sisters to report abuse to their superiors and police. And just last week, the women's magazine of the Vatican newspaper L'Osservatore Romano identified the clerical culture of the all-powerful clergy as the culprit. The magazine, 'Women Church World,' noted that the scandal involves a corollary: nuns being forced to abort the priests' children. 'It's a cultural problem. I dare say that humanity hasn't matured,' he said, adding that in some parts of the world the mistreatment gets to the point of feminicide. 'There are some priests and also bishops who have done it, I think it's still going on, because it's not something that just goes away like that. On the contrary,' he added. 'I don't want to hear it said that the Church has not got this problem, because it has. Must we do more? Yes! Do we want to? Yes!' said Francis. 'If the Church continues to close its eyes to the scandal - made even worse by the fact that abuse of women brings about procreation and is therefore at the origin of forced abortions and children who aren't recognised by priests - the oppression of women in the Church will never change,' editor Lucetta Scaraffia wrote. He said Benedict took action against the French congregation 'because a certain slavery of women had crept in, slavery to the point of sexual slavery on the part of clergy or the founder,' he said. 'Sometimes the founder takes away, or empties the freedom of the sisters. It can come to this,' Francis said. The pontiff made the acknowledgement after being in Abu Dhabi today on the final day of his historic visit to the United Arab Emirates. 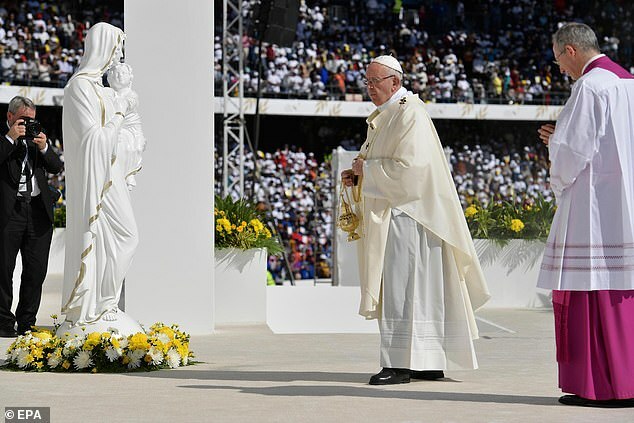 The 82-year-old pontiff held an open-air Mass for 170,000 people and led the service at a sports venue this morning where huge crowds waved Vatican flags and banners and an altar with a huge cross was erected for the Mass. 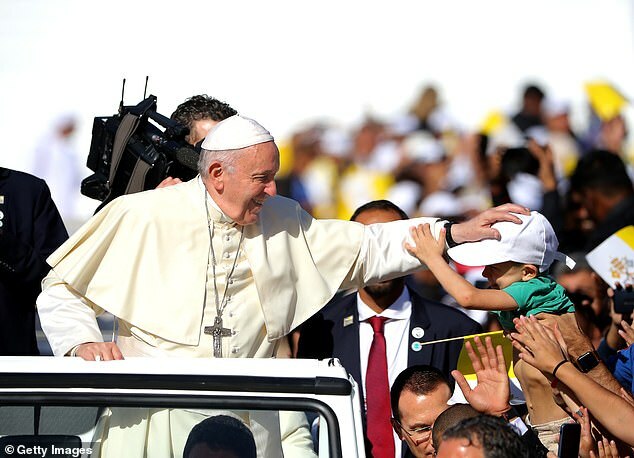 The worship was the centrepiece of the first papal visit to the Arabian Peninsula, the birthplace of Islam, in a country where Christian worship is usually allowed only inside churches. 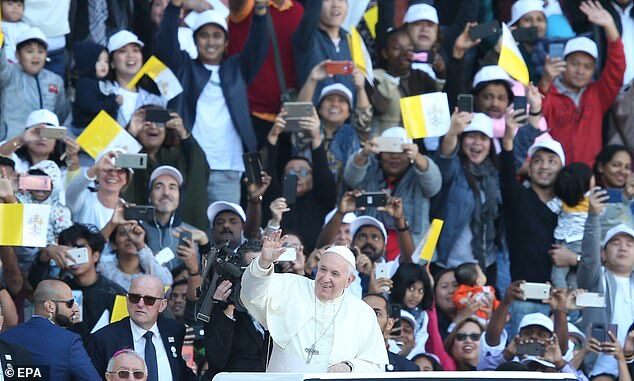 Inside the Zayed Sports City stadium, 50,000 Catholics with tickets to the Mass cheered the pope on, with one small group hoisting a pink poster which read 'We the Catholics of Yemen love you!'. Francis later praised the courage of a young girl who broke through police barricades in Abu Dhabi to hand-deliver a letter to him. 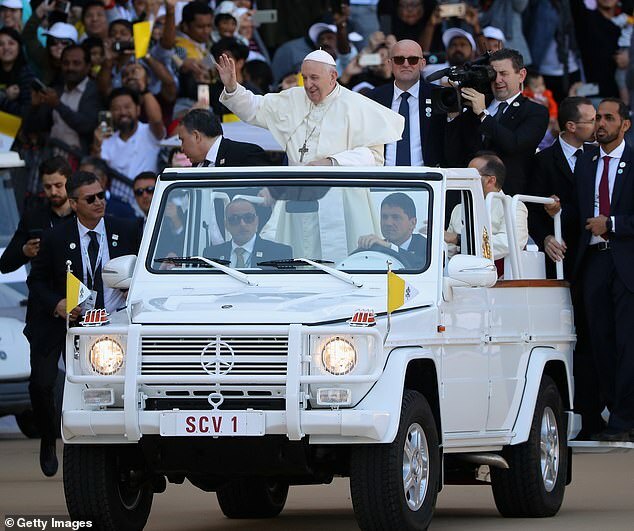 He was being driven around the city's sports stadium in his pope mobile before Mass when the child dashed from the crowd so quickly that police couldn't catch her. 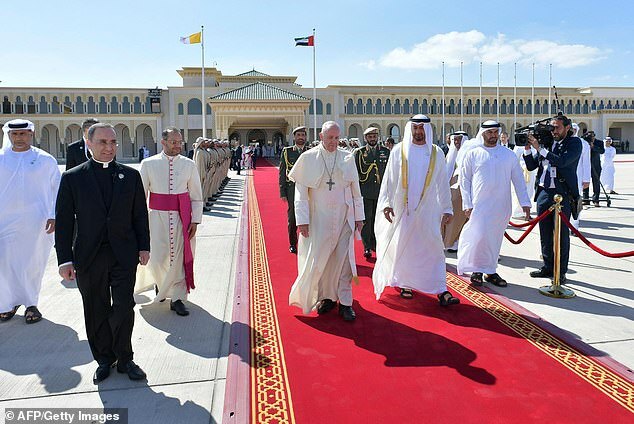 Pope Francis later hailed a 'step forward' in dialogue with Islam after his historic visit to the United Arab Emirates, which must still 'ripen like fruit'. 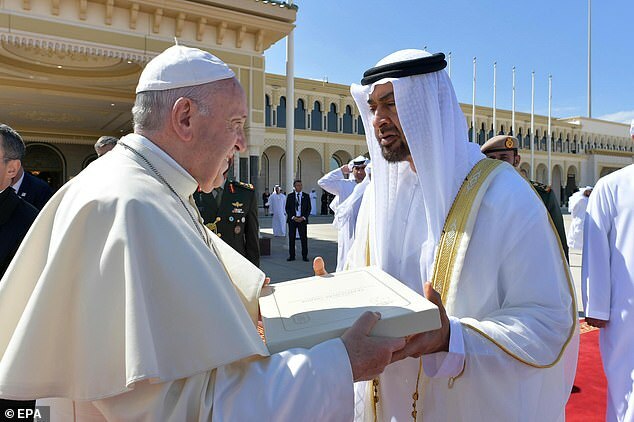 The pope made the statement in the plane bringing him back to Rome after a visit to Abu Dhabi, where he became the first pontiff to visit the Arabian Peninsula. He hailed the signing of a document on 'human fraternity for world peace' with Sheikh Ahmed al-Tayeb, the imam of Cairo's Al-Azhar, Sunni Islam's prestigious seat of learning. It called for 'freedom of belief', the 'promotion of a culture of tolerance', the 'protection of places of worship' and 'full citizenship' rights for minorities. 'The document was prepared with much reflection and prayer,' the pope said. 'Because for me, there's only one great danger at the moment: destruction, war, hatred between us. And if we believers aren't capable of helping each other, embracing each other... our faith will be defeated. 'I heard from several Muslims that it [the document] will be studied at university, at least at Al-Azhar, for sure, and in schools. It will be studied, not imposed,' he said. Pope Francis also said the Vatican would be willing to mediate in Venezuela if both sides asked, but preliminary steps to try to bring them closer together should be taken first. Maduro told Italian broadcaster Sky TG24 on Monday that he had sent the letter to the pope 'for help in the process of facilitating and reinforcing dialogue'. He said this would include efforts to 'to try to bring one (side) closer to the other, to start a process of dialogue'. The pope spoke as major European nations joined the United States in recognising opposition leader Juan Guaido as Venezuela's legitimate head of state, while members of a separate regional bloc kept up the pressure on Maduro.